The HAWK is a compact and sturdy wheelchair for active use. It comes with a solid frame, an ergonomic seat, an impressive drivability, and a vast number of customization options. It is adjustable to fit any wheelchair user’s dreams and challenges. The HAWK is made for all active wheelchair users (max. 120 kg) who need an adjustable wheelchair for daily use. It has features such as: An adjustable balance point, modifiable seat height and seat depth, flexible strap seat and flexible strap back. Furthermore, it has an adjustable back angle and adaptable back height. These seven features allow a continuous adjustment of the seating posture. The HAWK is made for indoor and outdoor use, it is easy to disassemble and easy to transport in a car. Panthera X has the chassis and back rest frame made in carbon fibre The carbon fibres fantastic lightness and strength makes Panthera X by far the lightest wheelchair in the world, with a transport weight of incredible 2,1 kg. With new state of the art technology to place the fibres in the right direction we have increased the strength even more. The lightness and stiffness of the chassis makes Panthera X fantastic to drive and to lift into, e.g. a car. Panthera X has a built-in rear axle, just like Panthera U2 light, To balance the chair you choose one of the 4 positions of the attachment for the backrest. The angle of the backrest is adjustable and the backrest height can be selected between 22 and 35 in steps of 1 cm. The footrest is adjustable in height. The U3 light is a wheelchair designed for the experienced active user who can handle a “tippy” wheelchair without anti-tip device. After long-terme sitting in a wheelchair many people develop problems with neck and shoulder pain. To help them reduce and/or prevent further problems we have designed the U3 light to make lifting and driving the chair as easy as it can possibly be without, of course, reducing the ergonomic features from the U3. The design is optimized for easy handling in and out of cars and extremely good driving characteristics. The very clean and minimalistic design gives the experienced active-user a big opportunity for improvements in his or her daily life. In its standard configuration, the U3 light has a carbon fibre rear axle, Spinergy X rear wheels, X footrest in aluminum and X castor wheels and a seat bag with integrated magnet. The U3 light exists in two different set-ups. “U3 light” with normal balance, and “U3 light L” with a more “tippy” balance. On the “U3 light L” the rear axle has been moved forward an additional 22 mm. It’s possible to adjust the position of the backrest by +/- 10mm, forward or backward, to calibrate the balance. Standard colour is pearl white or anodic black. From the attention to combine aesthetics, functionality and quality, was born the new ultra lightweight titanium fixed frame wheelchair EOS: perfect essence of style and elegance, unique in the details, from the original line and the exclusive design. Pram with rigid super light titanium frame. By attention to combining aesthetics, functionality and quality, was born the new wheelchair in titanium fixed frame EOS. Lightweight and resists because titanium composition. Carbon elements that help reduce weight and high maneuverability. In a variety of combinations. The Panthera U3 is an active wheelchair designed to let you live life as actively as possible. It is characterised by the attention that we have put into all of its details. Its low weight combined with the stable fixed frame and casters with a unique profile on the tread surface make this wheelchair very easy to manoeuvre. The chassis’ seating angle, along with adjustable backrest and seat upholstery and the backrest tilt function combine to provide extremely good seating comfort. The fabric used in the backrest upholstery has also been carefully selected for ergonomic and comfortable sitting. The chair’s balance point can be adjusted to enable you to find a setting that offers a feeling of security. Accessories such as armrests and side guards have a unique design and you can adjust the height and fore-aft position of the armrests yourself without using tools. 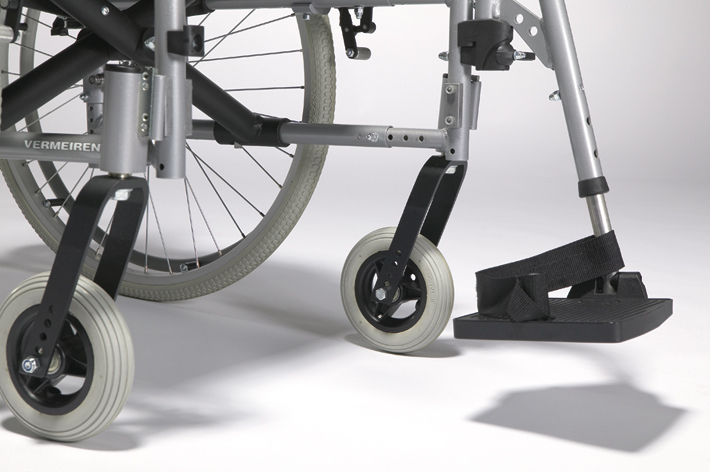 The soft upper section of the side guards fold down when loaded such as when moving into or out of the wheelchair. You can place your hands on the side guards when you lift yourself up or down. The attractively integrated anti-tip device can be folded in and out by yourself while you are seated in the wheelchair. 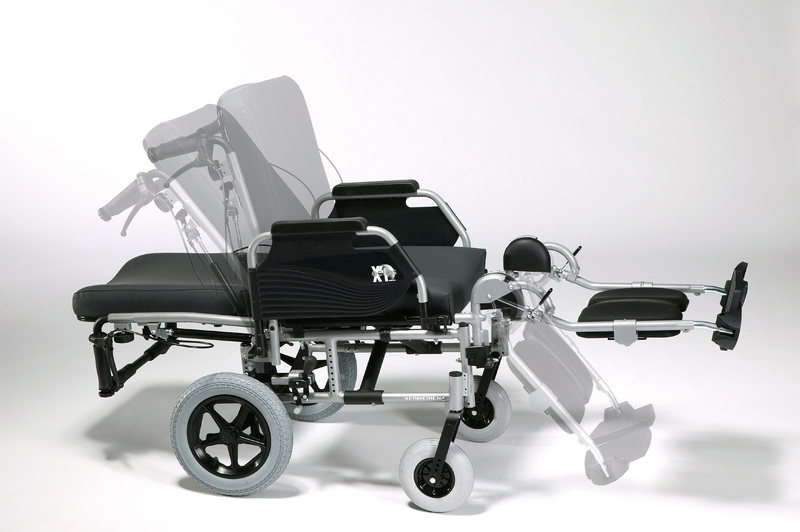 By adding suspension to the front wheels, we have a wheelchair with a high level comfort. Comfortable and sporty. The efficient backrest and seat offer appropriate support to the body and guarantee a high level comfort. In case of the standard version, the armrests can be adjusted in height and depth. The control unit can be easily reclined, for good access near tables. It is a revolutionary model for electric wheelchairs. The rear wheels are installed on special springs and, together with the front wheel suspension, enhance comfort during movement over rough terrains. Your safety is also taken into account. Front and back signals use LED lights and provide excellent visibility. Standard: 6 km/h, without seat adjustment and backrest reclining. An electric wheelchair to be used indoor/outdoor. The Soft version seat and backrest provide a feeling of comfort, regardless the situation. The back and front standard lights result in an optimal degree of safety when used outdoors in the evening. The 2×200 Watt (2x12V – 79 Ah) batteries are well placed under the seat, allowing you to use the chair even in rainy weather. Rapido combines comfort with technology. Rapido can be best characterized as “all-in-one”. Comfort, technology and design go hand in hand. Once again it was proven that a product with special technology does not have to be massive. Rapido weighs 38 kg and this makes it an extremely easy to handle product. The seat and backrest have an anatomic shape for optimal position and comfort for the user. As an addition, the armrests can be adjusted in height and/or depth, or they can be completely removed. Electric wheelchair with a microprocessor. It is easy to handle, with minimal effort for the highest degree of comfort. The controls can be customized. The speed, acceleration and sensibility of the joystick are parameters which can be individually programmed, for all the comfort that the user needs. Has easy to install/uninstall batteries, adapted seat and backrest for the purpose of folding, thus decreasing the total weight to 23 kg. Aluminum frame, foldable, easily stored and transported. Comfortable seat and backrest. Adjustable headrest. Offers the option of changing the handle’s position according to the direction of movement. Removable seat, adjustable in two directions. Ensures adjustment of the seat’s width and depth. Footrest with adjustable angle and length. Storage area for small items under the seat. Its new design with 25mm tubes offers Breezy 250 an enhanced durability and resistance. The new folding systems has no screws and no reinforcements, which translates into easy usage. It has a wide range of models and accessories, allowing for perfect fit for the patient. The adjustment of the weight center is simply made by changing the position of the axle bush. This allows a setting of the wheelchair that ranges between a more active and a more stable profile, or with a lower turning radius, based on the depth of the seat. Breezy 250 has 3 backrest heights, by changing the position of the front and rear wheels. H=50,5 cm; Rear wheel 24″ – position 1; Front wheel 8″ – position 1. I. H=48 cm; Rear wheel 22″ – position 1; Front wheel 6″ – position 1. I. H=48 cm; Rear wheel 22″ – position 2; Front wheel 6″ – position 2. The new design of the front frame and the position of the rear wheel means a 76.5 cm length, excepting the footrests. This facilitates the access to closed/narrower areas. Length of footrest 22-52 cm. Total weight of wheelchair 6.5 kg. Ultralight wheelchair for heavier users, made of aluminum, provided with double X support system and folding. EclipsXXL ensures comfort due to the anatomic shaped seat and backrest. This wheelchair has special wheels with armed rims. Transfer to the chair is easily performed due to the removable aluminum arms. EclipsX4 is part of a new generation of completely adjustable wheelchairs. It is made of aluminum. The seat is adjustable in 3 positions, both in height and depth. It has ergonomic push handles adjustable in height. The armrests can be folded to the back, removed or adjusted in height and/or length. Eclips is the newest ultralight wheelchair. The frame is made of aluminum, which makes the wheelchair light, but also very resistant. It has a 14.8kg weight and a maximum of 130kg transportation capacity. Easily adjustable by depth and height. The seat can be installed in different positions. The ergonomic push handles can be adjusted by height. The wheels are detachable. Thus, you can adapt the wheelchair in accordance with your needs and will. Even the armrests can be folded to the back, removed or height adjusted. V300 30° is a modern wheelchair which allows the positioning of the head and upper body. Positioning wheelchair for young adults. Seat width: 40 cm. Ideal wheelchair for children, made of aluminum tubes, resistant to small hits. The seat’s cover is designed for protecting clothes from getting caught in the wheelchair’s wheels. Being light-weight and foldable, it can be easily transported by train or car. Standard wheelchair made of high quality steel: – vertically foldable – removable armrests, – reclining footrest, – modular construction which allows the product¢s adaptation to the individual needs of the user – seat width: 32 cm and 37 cm – wheelchair weight 16 kg. Due to its reclining options, the INOVYS wheelchair allows you to have an ideal position all the time. Both the seat and the backrest can be easily and independently adjusted. Also, you can choose only items which suit your individual needs. You can also choose the frame color and upholstery color. The wheelchair is characterized by the high number of adjustment options of different parts: seat depth; position of the armrests; positioning angle of the foot and leg support; length of the footrest; depth of the footrest; push handle with height adjustment; headrest which completely covers the ears and is completely adjustable (L58); smooth backrest and wheelchair angle adjustment; adjustable width; rear wheels brakes; anti-tipping system. By selecting SERENYS you have purchased a wheelchair completely created for you comfort. SERENYS is a model exclusively designed for persons with low mobility, in order to be used independently or with assistance, both inside and outdoors – in some areas. In order to get accustomed with the product, please read the user’s guide carefully. SERENYS has an aluminum frame which also supports the backrest. The armrests, knee protection items and the footrests are made of highly resistant ABS plastic. Serenys can be handled by an assistant or by the user. It is an extremely comfortable wheelchair, designed for those who spend a lot of time in the wheelchair and can be completely adjusted in accordance with the needs of each user, to ensure the required position during movement or rest. The backrest’s angle can be adjusted by using a pneumatic cylinder. The backrest’s angle can be independently adjusted independent of the wheelchair’s angle. Serenys is available in three seat sizes, 39 cm, 45 cm and 51 cm, with adjustable depth from 44 cm to 50 cm and three seat height positions (measured from the ground to the wheelchair) from 43 cm to 52 cm. The arm positioning height can be adjusted. The headrest’s height and depth can be adjusted. The footrest’s angle, which has a knee protection wedge, can be adjusted, as well as the height, depth and width. The footrest can be folded towards the interior of the wheelchair. The angle and depth of the foot plate can be adjusted. The wheelchair’s backrest cushion, which is 50cm or 60 cm in height, and the rest of the upholstery are made of semi-memory foam and covered with DARTEX (soft) in order to provide maximum comfort for the user. EclipsX4, with a backrest angle adjustment up to 90 degrees, offers maximum comfort. The wheelchair is equipped with orthopedic seat and backrest, made of “soft” material. The adjustment of the backrest’s angle is made with the help of a spring system. The special headrest offers a correct position. 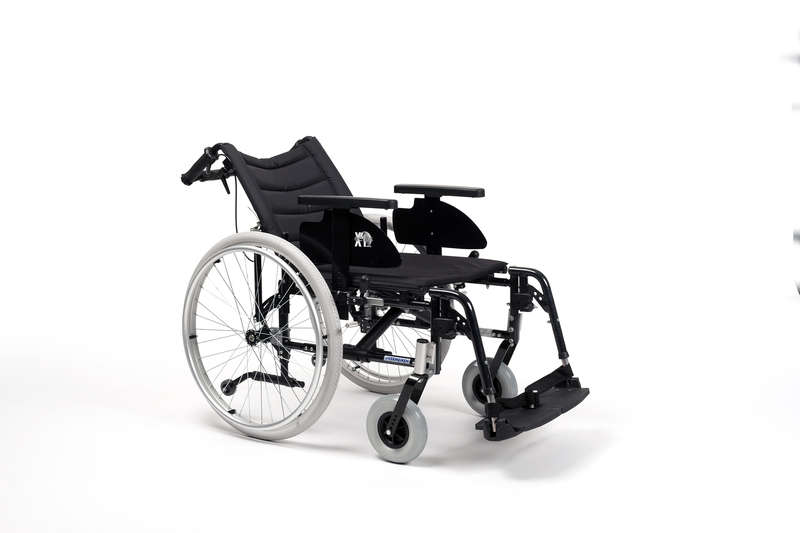 Eclips x4 90 seat and Bz7 backrest are included in the standard model. Eclips+ is a wheelchair with a backrest angle adjustment of 30 degrees. It is made of aluminum, as is Eclips standard. An excellent wheelchair for those who need a continuous repositioning of the backrest; a mix of endurance and functionality. Jazz is made of high quality carbon steel and weights 16 kg, 8 kg less than the standard models. The backrest’s angle can be adjusted up to max. 30°. The design of the constructive model offers maximum resistance. The wheelchair has easily removable wheels, footrests which can be height adjusted and detached, as well as reclining armrests. Due to all these options, after folding, the wheelchair takes up less space and can be easily transported in the trunk of a vehicle. The nylon upholstery additionally consolidates the entire structure of the wheelchair. Standard design for persons with hemiplegia who have the ability to use only one hand. Two metallic circles for pushing the wheelchair are attached to one of the wheels, with the option to install them on the right or left, based on requirements. The brakes are inter-connected for the purpose of stopping both wheels with one hand. The constructive design of the wheelchair increases comfort and functionality during usage. The armrests and footrest are removable. Standard transportation wheelchair with removable armrests and footrests. Width (cm): 49; 51; 54; 56; 62. Armrest height (cm): 17; 22. Seat depth (cm): 35; 43. Seat width (cm): 37; 39; 42; 44; 50. Design with weight balancing items for persons with one or both legs amputated. It can be equipped with leg supports for those with prosthesis. Due to its constructive design, the wheelchair offers comfort and functionality during extensive usage. The armrests and footrest are removable. Standard wheelchair with approx. 5 cm vertically adjustable seat which allows the user to push the wheelchair with his/her feet. The wheelchair is equipped with smaller sized front and rear wheels. Due to its constructive design, the wheelchair offers comfort and functionality during extensive usage. The armrests and footrest are detachable. Made from high quality carbon steel. We offer a wide range of colors, as well as a wide range of frame sizes, enhancing the wheelchair user’s comfort degree. Our wheelchairs have a modular design, which makes it possible to adjust the wheelchair in accordance with his/her needs. The armrests and footrest are removable. Maximum weight: 120kg. 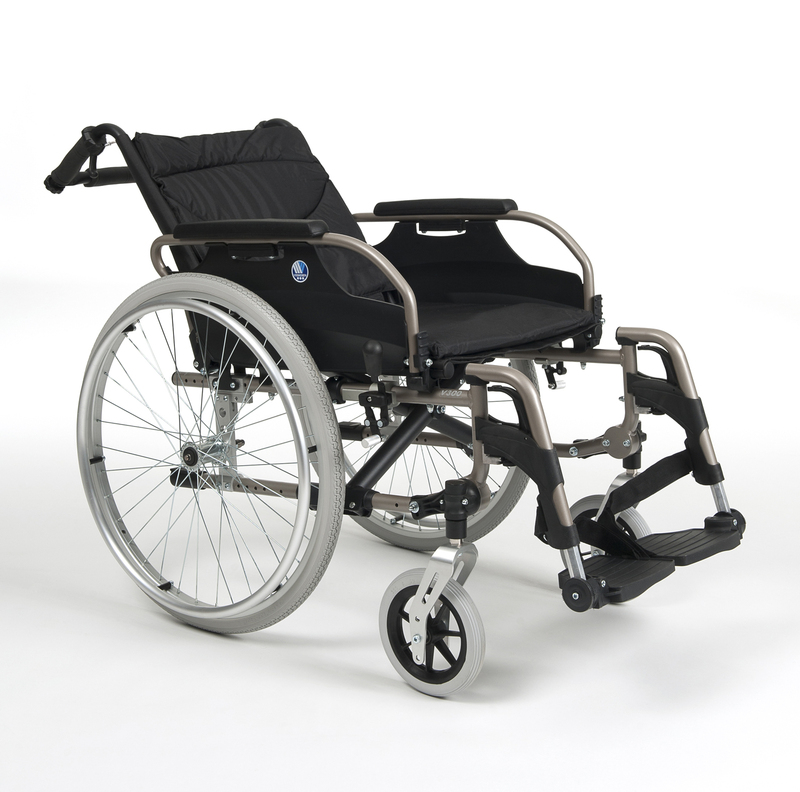 A high quality, strong and extremely light wheelchair. Escape is made of aluminum and has a weight of only 12 kg. This means that it weighs 5 to 10 kg less than a standard wheelchair. Maximum comfort is offered by its fine design and easily removable wheels. Created for patients with higher body weight. This wheelchair has a double X support system and can support up to 150 kg. The footrests are retractable and foldable. The office type armrests (allow easy access to a table) are provided with comfortable upholstery. The footrests are equipped with side wheels to protect the walls and furniture during movement.